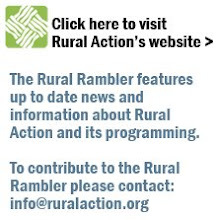 The Rural Rambler: Vote for River Network! New Belgium Brewery out of Fort Collins, Colorado is hosting a contest to give a $10,000 grant to the water-focused environmental group that gets the most votes. We at Rural Action would like to encourage folks to vote for River Network. They support our watershed programs with scholarships to attend River Rally, a national conference that brings together river groups, watershed associations, and conservation organizations to network, learn and work together to improve our nation's streams. Just follow the link - http://www.newbelgium.com/skinnydip, choose "Vote for a Cause" on the left side of the page and cast your vote today for River Network! Tell your friends to vote too!